I honestly didn’t think one would need to make more out of the Start Screen. I love Windows Phone’s Live Tiles, and the Live Folders feature makes it even easier to cram more app shortcuts even onto the tiniest screen. Then there’s the Action Center with its quick action slots and notifications – it seems like you get plenty of options to customize what now looks like a mini version of a computer’s desktop, but well tailored for a much smaller touch-enabled screen. I’m not afraid to admit my mistakes, yes…I was wrong! I recently stumbled upon this unique app called Quicky. The name hardly illustrates what it does. Speaking in general, it’s a shortcut app, but not like what may have come across before. 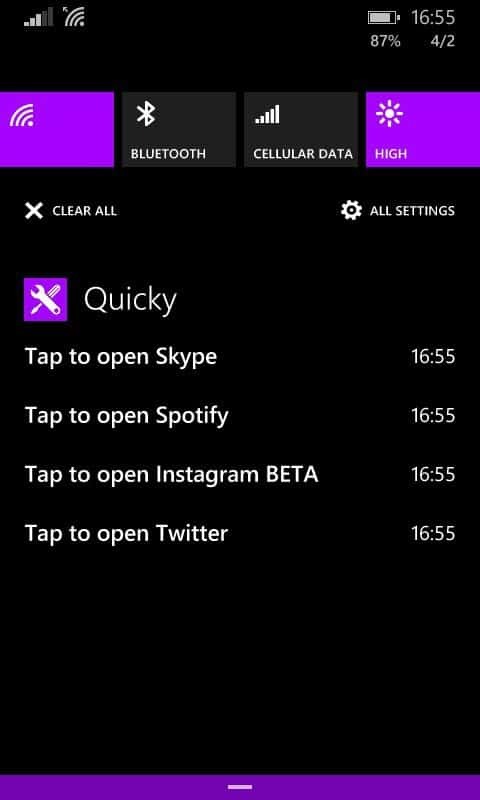 With Quicky you can use notification entries as app shortcuts. Perhaps you never thought you’d need something like this, but doesn’t it seem fun to use the notifications list like some sort of Speed Dial but for apps instead of contacts? 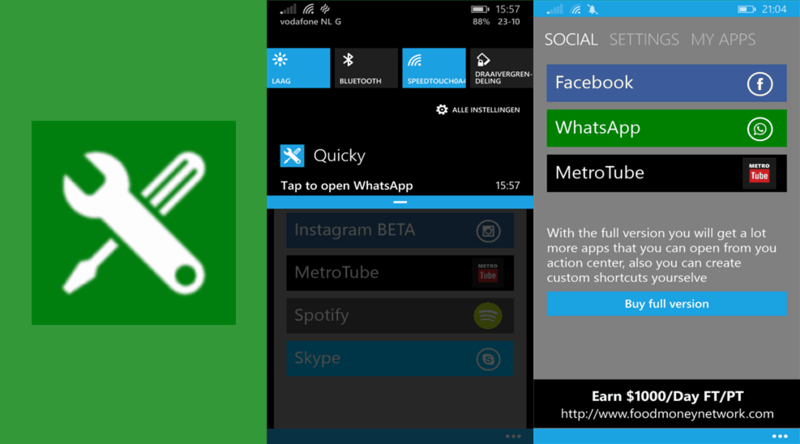 The interface has three different panes: one for social apps, where you get one tap shortcuts to the most popular names of this category, another for shortcuts to various settings and the last one, called ‘My apps’ is where you can add shortcuts to any of the apps you have installed as long as you have their URI schemes. The UI’s design is functional and it definitely doesn’t make any of the included options confusing. Other than that, it just looks like not much effort was put into it and it’s really a shame. WP’s clean look, makes it really easy for devs to come up with a modern style layout that fits the general theme with very little effort – no graphic designer needed unless you really want to, especially for a utility app like this one. The Social tab offers the ability to create notification shortcuts to several social apps and I won’t list them here because you can see all of them in the image above. If, for example you want to add a Facebook shortcut to your notifications list all you have to do is tap on its icon and I stress that, because pressing randomly on the Facebook bar does nothing – it’s not very intuitive in this case. When you press an icon, it will be highlighted for a second, letting you now it’s been added as a notification. A minor annoyance is the fact that pressing on the same icon several times adds the same notification over and over. In the Settings pane, things work differently. Taping on the icon takes you straight to that function and if you want to add its shortcut to the notifications area you have to tap on the bar (not on the icon…this time), and hold it until a pop-up menu appears. 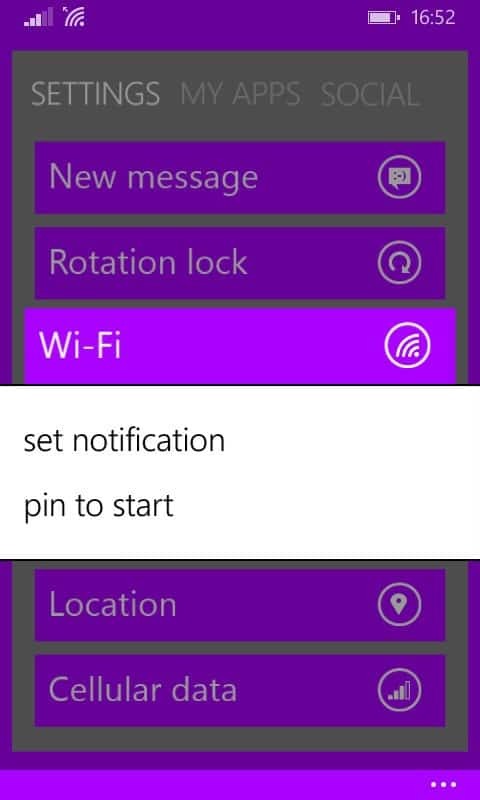 From the menu you can set it as a notification or pin it to your Start Screen. Despite the minor lack in consistency, things are ok so far. The ‘My apps’ tab is a bit problematic though. 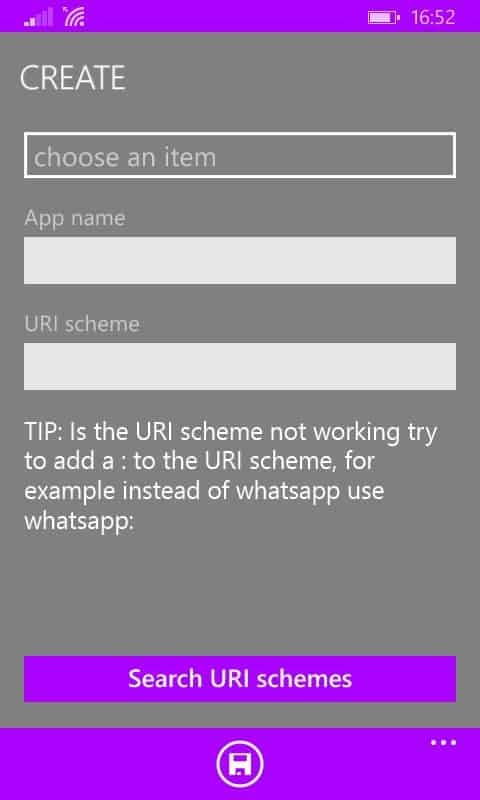 In theory, you can add a shortcut for any app, if you have its URI scheme. The developer was kind enough to offer a shortcut to one of Nokia’s websites that had over 3000 URI schemes. I say ‘had’ because developer.nokia.com, the site in question was closed on March 31, as a result of Microsoft’s acquisition of Nokia’s Devices and Services division. Since the change is very recent, there’s a good chance Quicky’s developer is going to find a way to make these schemes available again and hopefully soon, because this limits the app’s functionality in a significant way. Quicky’s features I was able to use worked great – the notifications you add will stay there until you decide to clear them from the list, just like any other notification. There are a few things I would love to see being added though. Firstly, those URI schemes that let you add your own apps need to be made available again, but I wouldn’t mind being able to customize the Social and Settings lists too. 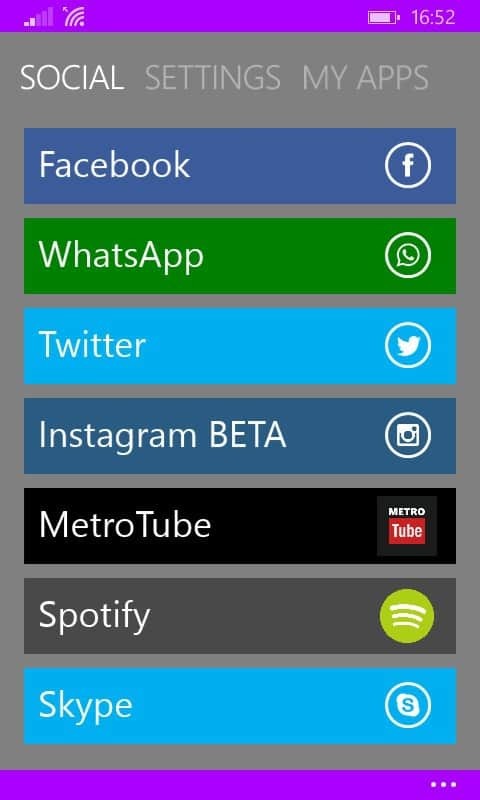 There are more Social apps than the ones listed in Quicky and it would be nice if users could add them to their own category. Also, adding more categories could be another useful option especially when your custom apps list is getting large and messy. What I’m still confused about is whether Quicky is free or not. The app is listed as freeware in the store, but in its description you can see “With the trial version you can test if the app works”. There’s also another version of the app called Quicky FREE and it has the same line in the description. Furthermore, while using the app I wasn’t able to find any option to buy the app, or upgrade it in any way and there are no ads either, which is a bit weird since the official screenshots show an ad banner. For now, I’m going to assume its free and update this post if anything new comes up. The idea behind Quicky is brilliant: it turns those notifications into something entirely new. However, if you rely heavily on your notifications (I mean their original purpose), you’re probably not going to want to spam the list with app shortcuts. In the end, it all comes down to how you want to make use of the notifications, but at least Quicky makes it possible to use them for something else than their intended purpose, if that’s what you need.